The Tektronix 585 is a 100 MHz 580-Series scope that Tektronix introduced in 1959. The 581 is the same with a single timebase. The 585A facelift model was introduced in 1963 and discontinued after 1971. The 58x series were the first Tek scopes with distributed deflection plates and the last with a distributed amplifier. At 100 MHz (down-rated to 95 MHz in 1962 and 85 MHz for the 585A) with the Type 80 plug-in and up to 85 MHz with the dual-channel Type 82, they were the highest-speed general purpose scopes of Tek's tube scope era (the 1 GHz 519 was specialized with no vertical amplifier). 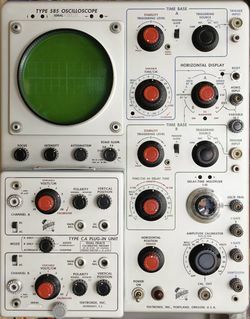 The 585's front panel layout is almost identical to the 545A that came out at the same time. The 585 also shares internal construction and circuits such as the power supply with the 535/545 line of scopes. The 585A uses a tunnel-diode trigger circuit (see below), adds HF Sync and AC LF reject modes to the timebase A trigger selector, and adds a trace rotation coil. Later on there was another special CRT designed with distributed vertical deflection for the 100 Megahertz 580 (well almost 100 MHz). The 580 was the first to, at least at Tek, to use a cross wound continuous signal delay line. The 580 used a similar horizontal system lifted from the 530’s which was too slow and insufficient writing rate. The active probe and plug in system left a lot to be desired. I wasn’t very proud of the 580 design as it was too compromised. The Type 81 adapter allows the use of letter-series and 1-series plug-ins in a 585. The original 585 (up to serial number 1070) has an "A" trigger circuit that has a differential trigger amplifier made of a pair of 6EW6 miniature pentodes, followed by a Schmitt trigger made of a pair of miniature dual triode tubes. Starting at serial number 1071 (and sometimes retrofitted to earlier instruments), the dual-triode Schmitt trigger circuit was replaced by an STD615 10 mA tunnel diode AC-coupled to the base-emitter junction of an OC171 germanium PNP transistor as a pulse amplifier. The slower "B" timebase uses a Schmitt trigger circuit. Like the 545, 551, and 555, the 585 uses two distributed amplifiers in the vertical signal path, one with seven differential 6DJ8 stages driving a helically-wound, differential delay line, followed by a five-stage differential distributed driver amplifier and a 7699 or 6939 dual tetrode power stage driving the CRT. Unlike the other 500-series scopes, the 585 uses a CRT with distributed vertical deflection plates, the T581, enabling it to have both fast rise time and high sensitivity (~5 V/cm vertically), albeit at the cost of limiting vertical deflection to slightly over 4 cm. Total acceleration voltage is 10 kV. Several improvements were published for the 585 circuitry, including the enhanced trigger circuit. If all of those changes are applied to a 585, it is essentially a 585A. After serial number 2585, the back termination of the final distributed amplifier output was made adjustable. The manual says this (field-installable) modification (040-275) is "required for proper operation of plug-ins with numbers above Type 81". Non-A instruments with this termination have a front panel label reading "standardized vertical". The 585 power supply is similar to other Tek scopes of the era such as the 549. A linear regulator with a 5651 reference tube, a 12AX7/6AU6 error amplifier and three parallel 12B4 series pass tubes produces −150 V. This is the only adjustable rail, all other regulated voltages are referenced to it. The +100 V and +350 V regulators use half a 6080 each as the pass element, the +225 V two. In the +500 V path, a 12B4 performs this function. The unregulated +325 V input to the 225 V regulator is used to supply the HV oscillator, a 6AU5. A transistor-based regulator supplies a +12.6 V heater voltage to the plug-in. A 6N045 delay relay controls a multi-contact relay to switch supply voltages on only after the tubes are warmed up. When the main relay engages, the delay relay is cut out so it will be ready to delay again even after a quick interrupt in power input. The 585 contains a 53°C (128°F) thermal cutoff. The 585 uses semiconductor diodes as rectifiers and germanium transistors in the 12 V power supply, and except for unmodified instruments before SN 1070, a tunnel diode and another germanium transistor in the time base A trigger circuit. Rackmount versions were also made, the RM585 and RM585A. Distributed delay line driver amplifier (bottom). Plug-in interface connector to the left. Vertical amplifier (post-delay 5-stage distributed amplifier). Pre-SN 2585 fixed termination. This page was last edited on 13 December 2018, at 05:11.